Compact and portable, this player/recorder is attractive to adults and youth alike. The rugged, lightweight, impact resistant design of Telex players is ideal for use by preschool, K-6 students and adults that have a visual, physical, or learning challenges. 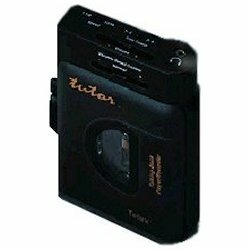 Plays 2 and 4 track tapes at variable speeds and records both speeds in 2 track. 1 year warranty.